Thanks to the unique possibilities offered by ESO's Very Large Telescope Interferometer (VLTI), astronomers have solved a 140-year-old mystery concerning active hot stars. They indeed show that the star Alpha Arae is spinning almost on the verge of breaking and that its disc rotates the same way planets do around the Sun. "This result could only be achieved because of the great details we could observe with the AMBER instrument combining three 8.2-m Unit Telescopes of ESO's VLT," said Philippe Stee, leader of the team that performed the study ". With AMBER on the VLTI , the astronomers were able to see details on the scale of one milli-arcsecond, corresponding to being able to distinguish, from the Earth, the headlights of a car on the Moon. Lying about 300 light-years away from the Sun, Alpha Arae is the closest member of the class of active stars known as 'Be stars'. 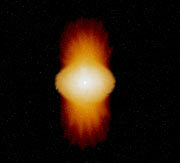 Be stars  are very luminous, massive and hot stars that rotate rapidly. They are losing mass along the poles through a strong stellar wind and are surrounded at the equator by a disc of matter. Alpha Arae has ten times the mass of the Sun, is three times hotter and 6 000 times as luminous. The question how the discs around active stars known as Be-stars rotate was posed since the discovery of the first one, Gamma Cassiopeiae, by Italian astronomer Father Angelo Secchi, exactly 140 years ago, on 23 August 1866 in Rome. With AMBER, the team of astronomers could examine in details the structure of the disc surrounding Alpha Arae. Moreover, because AMBER also provides spectra, the astronomers could study the motion of the gas in the disc and so understand how it rotates. "Although previous theoretical studies had already provided some indications, our result - the first to supply observational evidence - may be the final exclamation mark regarding this puzzle", said Stee. The scientists found the material in the disc surrounding Alpha Arae to be in 'Keplerian rotation', that is, obeying the same rules as discovered by Johannes Kepler for the planets circling the Sun: the velocity of the material decreases with the square root of the distance from the star. The new result rules out the possibility for the disc to rotate with a uniform velocity, as would be the case if a strong magnetic field were present that would oblige the matter to spin at the same rate as the star. Combining the new data with previous studies, the astronomers also show that the star Alpha Arae, which is five times larger than the Sun, rotates around completely in about half a day, 50 times faster than our Sun. In fact, with a speed at the equator of 470 km/s, it is spinning so quickly that it is near its break-up velocity. Matter having such a critical velocity would be able to freely escape from the star, in the same way that we would be ejected from a 'gone crazy' merry-go-round. "This nearly critical rotation may be the clue to the 'Be phenomenon'", said Stee. "It may bring sufficient energy to levitate material to create the circumstellar disc." Finally, the astronomers were also able to show that the star loses mass through a stellar wind emerging predominantly from the poles and reaching velocities of the order of 2000 km/s. These observations demonstrate once again the great potential of the ESO Very Large Telescope Interferometer that allows astronomers to combine 2 or 3 of the VLT Unit Telescopes or the associated moveable Auxiliary Telescopes, to obtain great details with spectroscopic information. 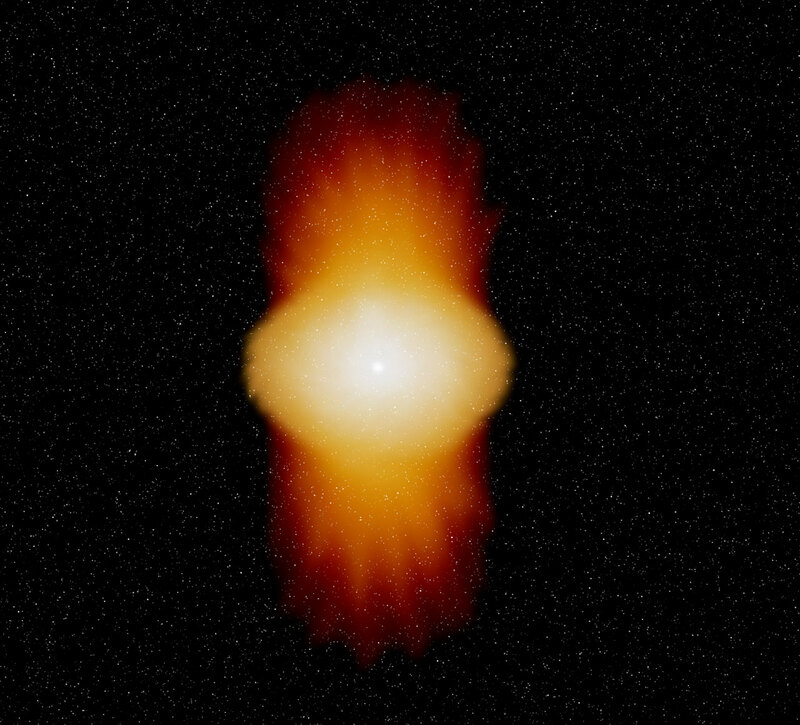 The VLTI already provided useful information about other very fast rotating stars, such as Achernar or Eta Carinae. : The team is composed of A. Meilland, Ph. Stee, A. Spang (Observatoire de la Côte d'Azur, France). F. Millour, A. Domiciano de Souza, R. Petrov. (Université de Nice, France), M. Vannier, A. Richichi (ESO), C. Martayan (Observatoire de Paris, France), F. Malbet (Laboratoire d'Astrophysique de Grenoble, France), and F. Paresce (INAF, Italy). This result is presented in "First direct detection of a Keplerian rotating disk around the Be star Alpha Arae using the VLTI/AMBER instrument", by A. Meilland et al., in press in the research journal Astronomy and Astrophysics. : The Astronomical Multiple BEam Recombiner (AMBER) is a near-infrared, multi-beam interferometric instrument, combining simultaneously 3 telescopes. It was built in collaboration with ESO by a consortium of French, German and Italian institutes. It is offered to the users since October 2005. For more information, see the AMBER homepage. A press release about the First Light is available as eso0413. : Be stars are stars of spectral type B, with emission lines in their spectra, hence the "e". Because they are an important source of ultraviolet photons, Be stars play an important role in the heating of galaxies. What causes B stars to become Be stars is not yet well understood.